Even if you’re the only person involved in social media marketing at the beginning, write up a few general policy guidelines for yourself that you can expand later. 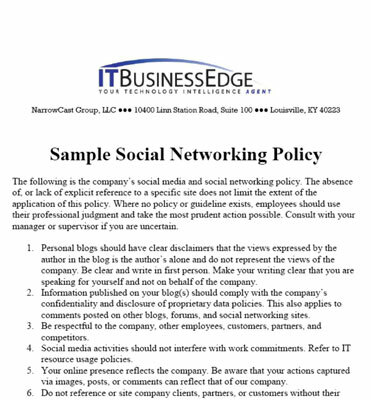 The ITBusinessEdge site shows a simple social media policy that you can download. Employees may not be allowed to use personal social accounts on company time. Some trained employees may be allowed to post customer support replies on behalf of the company, whereas others are responsible for new product information. To increase compliance, keep your policy short and easy to read. Try to focus on what people can do rather than on what they cannot do. A typical policy addresses risk management, intellectual property protection, individual privacy protection, and the respect of your audience, company, and fellow employees. Given the rapidly changing world of social media, you’ll have to keep your policy flexible and update it often. Hold individuals responsible for what they write. Disclose who you are, including your company name and title. Recognize that clients, prospects, competitors, and potential future employees are part of your audience. Understand the tenor of each social media community and follow its precepts. Protect your company’s confidential trade secret and proprietary information in addition to client data, especially trade secret information under nondisclosure agreements. Do not allow personal social media activity to interfere with work. The complexity of your social media policy depends on the extent of your social media marketing effort and the number of people and departments involved. Generally, the larger the company, the longer the policy. Just about everything in social media pushes the limits of existing intellectual property law. So much information is now repeated online that ownership lines are becoming blurred, much to some people’s dismay and damage. When in doubt, don’t copy. Instead, use citations, quote marks, and links to the original source. Always go back to the original to ensure that the information is accurate. Watch blogs such as Mashable and TechCrunch for information about legal wrangling. New case law, regulations, and conflicts bubble up continually.